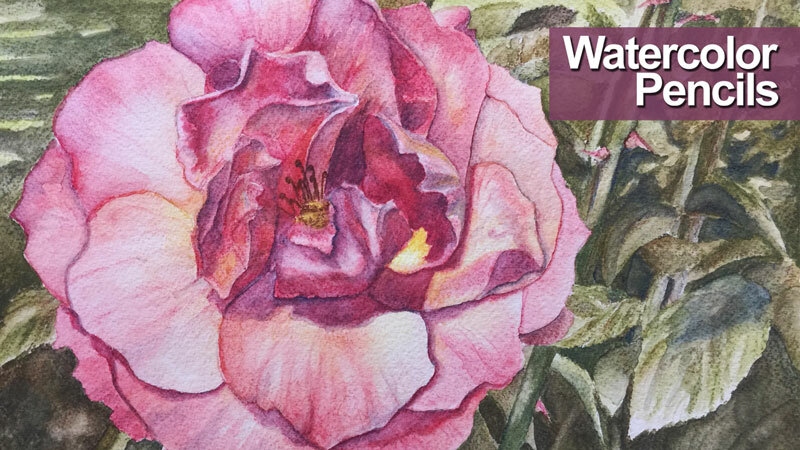 A five-part lesson series on drawing and painting with watercolor pencils. After a contour line drawing is loosely created with graphite, the process of layering colors begins. As each combination of colors are applied with the pencils, they are activated with water and shaped with the brush, giving the artist the ultimate control. Only a few colors are required to develop this soft image. The rose looks orange on my screen. Why did you choose reds to paint the flower? Thanks for your question. The colors are altered in the art in order to increase the contrast and to make the work a bit more aesthetic. It’s okay to deviate from the colors that are observed if you feel that it makes the art more successful. In this case, I like the reds a bit more than the strong oranges. There is still a bit of yellow used with the reds, creating muted oranges in areas. I am a relatively new member and new at art and am enjoying this instruction very much. I recently finished watching all 5 recorded lessons on this topic and thought I would let you know how much I enjoy this in-depth instruction. During the sessions, I heard you express some concern that your students might think they were too long, but I think you give a very realistic view of how long the process truly takes. We have access to plenty of speed paintings and abbreviated sessions from other sources, e.g., YouTube. Those have been helpful to me, but also make me think I must be working slowly. Your lessons clear up any misconception like that. I also liked your comment to view each part of the painting as an individual painting, I.e., that each petal can be considered an individual painting. I started a different flower in watercolor pencils after watching this, and my patience is much greater viewing each petal as an individual painting. So today, I finished four paintings and think I am well on my way to completing the project. I also like attempting different mediums so your instruction is excellent for me from that perspective in that you appear to offer all of them. Thanks, keep up the good work, and know that you have students who appreciate your taking the time to present something completely. Matt, why do you use nylon brushes for this? I have a natural hair brush (Winsor Newton sable), will that work just a well? thank you! Hi Matt, Can Derwent Inktense pencils be used instead of the watercolor pencil?